Nowadays world market offers a number of technologies to recover energy from waste. Some of them are popular as pyrolysis, gasification or plasma treatment. Another as incineration are often treated as outdated and even discarded. In our daily activity, we encounter a number of common delusions concerning incineration, which lead to total misunderstanding of prevalence and roles of modern waste-to-energy technologies. That is why we think it is needed to comment the current situation. The map below shows quantities of waste-to-energy plants in Europe (blue numbers) and amounts of waste in million ton being annually incinerated (red numbers). Even if we do not offer incineration plant to our clients, we need to use incineration as reference point, since it is world prevalent, most approved technology. Incineration is not discarded, as mentioned by some observers, but vice versa. It is possible to download an extract from 1000-page report “Waste to Energy 2015/2016” by Ecoprog, a professional consultant, well-known by comprehensive market researches. 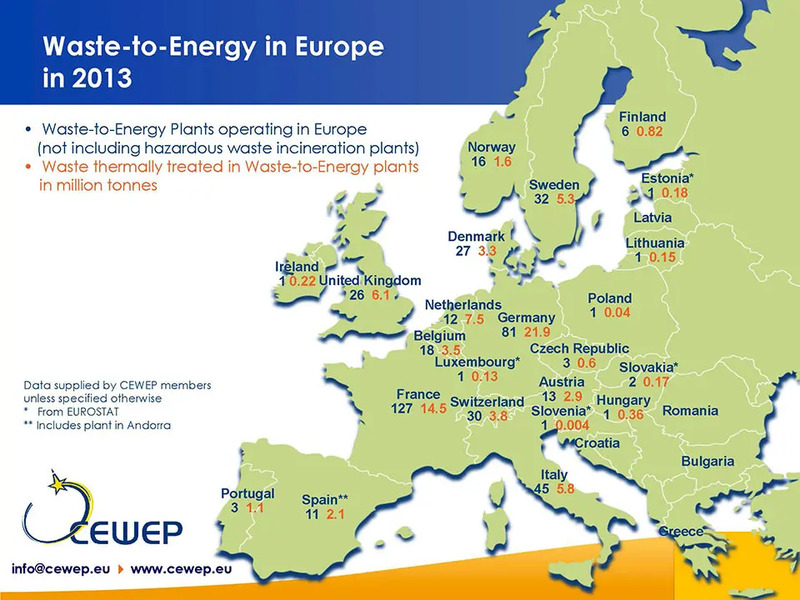 Ecoprog says: “Today, more than 2,200 WtE plants are active worldwide. They have a disposal capacity of around 280 million tons of waste per year. More than 250 thermal treatment plants with a capacity of nearly 60 million annual tons were constructed between 2010 and 2014. We estimate almost 550 new plants with a capacity of about 150 million annual tons to be constructed by 2024.” As we can see from page 4 of extract, ECOPROG considers only “9.2 Thermal treatment: incineration & gasification” technologies. This is because other technologies, including pyrolysis and plasma treatment, have very small portion of the market. It is hard to offer incineration plant to the clients, because quite often people’s opinion is based on rumours and wrong knowledge of the market. However what is evident: we have to compare any technology to incineration, since it is most approved and widespread technology in the world. We cannot compare our offer with some doubtful pyrolysis producers, whose equipment has no successful track of record. That is why when we offer ENCORE and another American pyrolysis technology designed mostly for MSW, we always compare CAPEX, OPEX, capacity factor, energy generation, with the incineration plant of similar capacity. This method gives our client a solid starting point for understanding the project and the technology. And of course, incineration is still developing and it has not said its last word in global presence on waste-to-energy market.